As on my previous posts, we arrived Saturday night in the pouring rain and freezing conditions. Our hotel made others in Nepal look like a 5 star resorts. How does no heating, a squat toilet, beds like cement, things on the walls that are unrecognisable, having to wear a whole wardrobe to bed and no hot water sound for starters! That said my roommate is gorgeous and the neighbours aren’t too bad either! Then we woke in the morning to the most magnificent view from the balcony on the hotel – the Himalayas in all their glory in the early morning sun. We had all our meals at the Manna Café just near the hospital. We have Pooja – a delightful Nepalese nurse with us who works in Sydney with us – and she organised all our meals and they have been fantastic! From a distance it looks like a ramshackle collection of rundown buildings, and close up not much better! A new hospital is being built but is far from finished. We got off to a slow start as we had to find out where things were and unpack what we had bought with us. There is 1 operating theatre that you have to walk through a minor theatre to get to. To get to that you have to go through an orthopaedic outpatient area – and did we see some sights in there why we were here! There was another door from the operating theatre that led through to the labour ward & maternity ward. That was an area we got to know quite well. We finally got underway with our first case and all went well. Just as we were finishing, they bought in an emergency caesarean section patient. There are 2 operating tables in the room so there was now a patient on each. Dr Andrew delivered the baby with the assistance of Dr Lomi who is working here for a few months while others are away. Andrew did a superb job, but the mother was very sick due to the blood loss. You just can’t call the blood bank here – 2 relatives donated blood during the surgery, and a lovely French medical student, Anne-Louise, donated blood the next morning. When we left Dadeldhura the mother was up and about and recovering well. We did another prolapse case that day and went home exhausted and wondering what the next day would bring. Another cold night with no hot water. The sun was shining so the hotel staff said we would have hot water (solar). But unfortunately their idea of hot water and mine are vastly different! Had a “bucket wash” with cold water then into bed to try to warm up – wearing my whole wardrobe of course! Started the day with washing my hair in of course freezing water over our bucket. Just managed to dry it when of all thing that could happen, our hair dryer broke!! Monday went fairly well. We weren’t able to start operating until after 9am which put us a bit behind. We sorted that out and were able to start at 8am on the following days. Mind you – at 8 am there are no hopsital staff around, “sterile processing” (!!!) isn’t open, sometimes there was no electrcity, no sterile theatre gowns or drapes! So the 8 o’clock start usually was more of an 8.30 to 8.45 start but at least we tried! We did 3 cases as one got cancelled, but it was probably enough to help us get sorted out more. We had 4 prolapse patients on the list for the day, and managed to get through them all. We had hoped to do up to 5 a day but with the 1 operating theatre it didn’t look likely. We had just finished the 2nd case for the day when they rushed an emergency caesarean section patient ino the room and put her on the 2nd operating theatre table. Dr Andrew & Dr Lisa finished their case and we were just about to head off for lunch when they realised that there was a problem with the caesar. They both pulled on sterile gloves and stepped in to help. Andrew delivered the baby, but the baby needed resuscitation. Andrew ran with him into the delivery area next door with me hot on his heels. We had to actively resuscitate him, and luckily he came good after a few minutes. He weighed 2.1 kg, and was the first son after 2 daughters. I checked up on him a few times – at home any baby who needed the degree of resuscitation he needed would have been admitted to our nursery, monitored, in an incubator, had blood sugars done, tube feeds etc. In Nepal he was wrapped in some warm clothes that had been donated, and left in bed with his mother. He wasn’t sucking much the first day and I was a bit worried – he still looked very frail. But the staff managed to get some formula into him with a spoon, and by the next morning he was feeding every 2 hours from his mother. His big sister was there to look after her mother and the baby (she looked about 10) but they had no money for food. We gave the mother enough money so they could have some food for the time they were at the hospital. I also found out that the baby clothes I was given to wrap the baby in had almost run out. 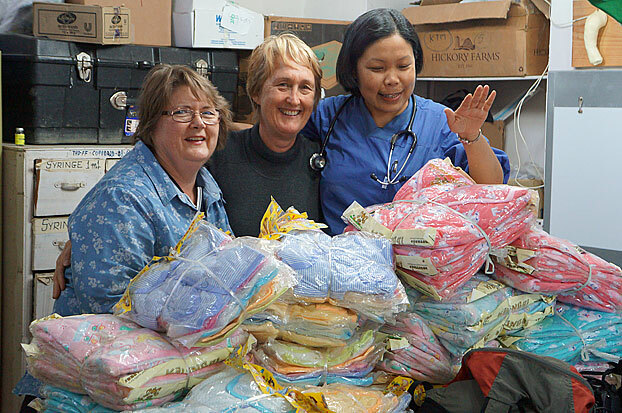 Kathy & I saw some baby blankets and clothes in one of the shops as we were walking home, so on the day we left, with Pooja’s and Andrew’s help, we bought 40 blankets and 40 sets of baby clothes and gave them to the hopsital. They do about 1,200 deliveries a year so they won’t go far, but that is 40 babies that will have something warm to wear. We had enough by now of going unwashed so went to the hotel guest accommodation (where we were meant to be staying – but that’s another story) and took turns having a hot shower and using their wi-fi which was much better that the hospital or our hotel. Another 4 prolapse cases and another 4 on the list for Thursday – our final day. All going routinely until Dr Andrew was called to Maternity again. A lady had arrived who had been in labour for 3 days. We had another emergency – this time the uterus had ruptured and the baby was outside the uterus. Sadly the baby had died, and the mother’s life was in the balance. 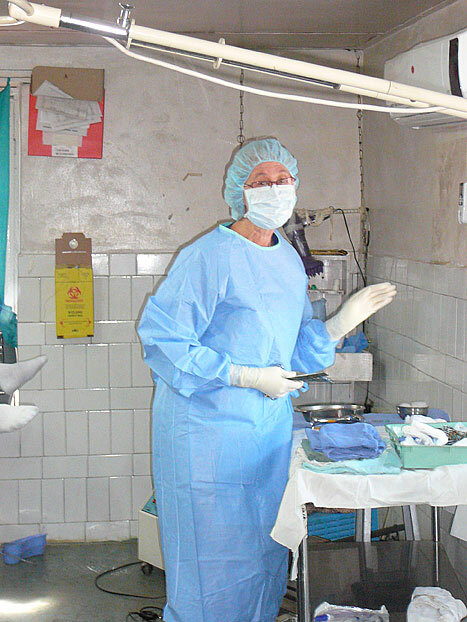 Andrew worked with Dr Lomi to deliver the baby, which was difficult. Unfortunately the tear in the uterus was too big and he had to do a hysterectomy. Amazingly the mother survied – which in itself is a miracle. Without our team being here I doubt that she would have. 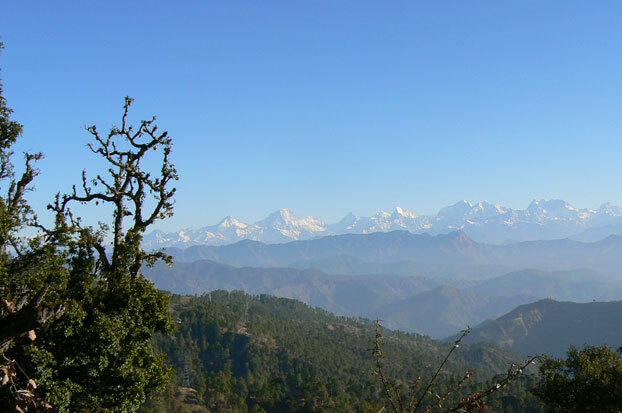 Another clear sky and superb views of the Himalayas. Another 4 cases planned. We had done 2 when we found out that the nursing staff had prepared a 5th woman for theatre accidently because she had exactly the same name as our 2nd patient! We had already decided that day not to do more that 4, but what to do now? After discussion with all the team it was decided to go ahead – but to do both operations at the same time. So we had a “cast of thousands” in the operating theatre, while praying that there wouldn’t be another emergency caesarean section! 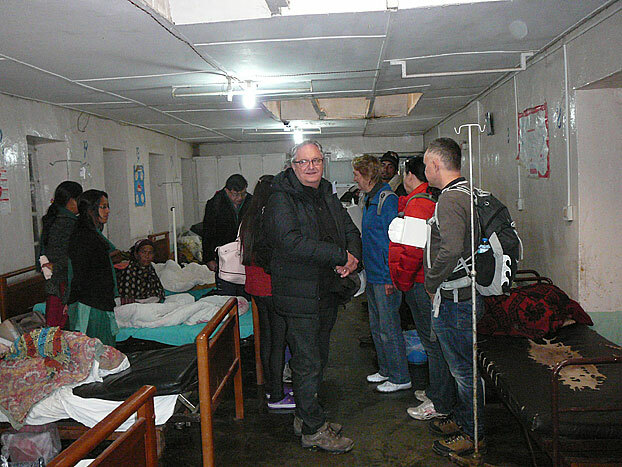 At some stage during the day the door between the orthopaedics outpatients room opened and 3 men carried in a stretcher with a screaming Nepalese woman on it and put it on the floor at our feet. We had no idea what we were supposed to do! We called for Pooja (a very common occurance!) and found out that the lady had just been gored in her abdomen by a bull. Dr Ken checked her out and made sure there was no major damage, and left it for the hospital staff to clean and suture the wound. 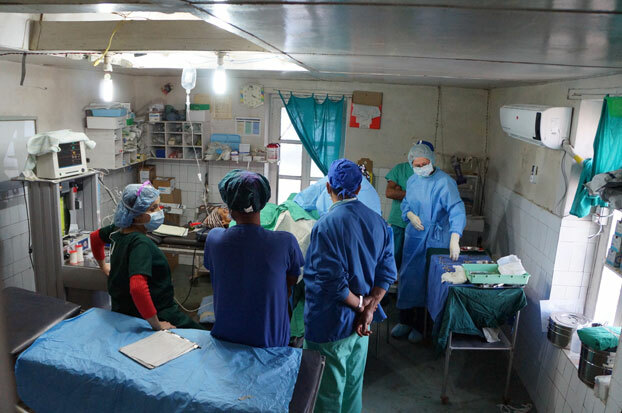 Just another day in an isolated, under staffed, under resourced hospital in remote far west Nepal! So all up during our stay we did 18 uterine prolapse cases and 3 emergency caesarean sections. Our aim was to do 20-25 cases so we met that. We are happy with the way the pilot program went, and all being well, plan to return next year. More to follow soon from the project at the Scheer Memorial Hospital.